If you asked us to point you in the direction of a well-equipped Radeon RX Vega 64 card, and if there was more differentiation between the boards that do exist today, we could definitely recommend checking out PowerColor's Red Devil RX Vega 64 8GB HBM2. Like Sapphire's Radeon RX Vega 64 Nitro+, the PowerColor card is particularly eye-catching. And it lights up, if you're a proponent of drawing attention to flagship-class graphics hardware in a windowed case. Up against the other Radeon RX Vega 64 cards, PowerColor's solution stands strong with a powerful cooler and better-than-reference performance. However, it's still priced unreasonably high, particularly compared to GeForce GTX 1080 boards selling for hundreds of dollars less. Unfortunately, today's market makes it almost impossible to distinguish between one Radeon RX Vega 64 or another. You may find a handful of models in stock (an improvement compared to a few weeks ago), but they still start just under $800 and reach as high as $900. While PowerColor does land toward the bottom of that range, you're still paying a $200+ premium over many GeForce GTX 1080 models. Right out of the gate, PowerColor is fighting an uphill battle against less expensive and sometimes faster competition. Weighing in at 1409 grams, this card lands just below Sapphire's monstrous flagship, which proved to be a an exhibition of sorts and is no longer available. PowerColor's solution is real though, and it's a massive beast just like Asus' ROG Strix Radeon RX Vega 64 8GB OC Edition. Similar to that card, the Red Devil measures 30.2cm long. A height of 12.7cm from the motherboard slot's top edge to the top of the fan shroud also matches what you get from Asus. But a depth of 5.2cm is notably wider. Hopefully that translates to even better cooling performance. Three 90mm fans are mounted in 92mm openings. With their special shape, a total of nine blades per fan provide powerful throughput and less turbulence, generating a bit more static pressure. This should prove complementary to the deep thermal solution. The backplate is characterized by a printed Red Devil logo. That plate doesn't help with cooling at all; it's primarily meant to look good and give the heavy card some rigidity. Plan for an extra 5mm of clearance (at least) behind the Red Devil RX Vega 64. This may cause problems on some motherboards, particularly if the heat sink/backplate intrude on an occupied expansion slot or large CPU cooler. As we can see from the bottom, PowerColor employs vertically-oriented fins. At the expense of occupying a third slot with its 2.5-slot design, the company does provide a lot more surface area for cooling. The top side shows that PowerColor stays true to itself in the Red Devil's design. In addition to a familiar dark metal cover on the red ABS shell, there is an illuminated Red Devil logo in the middle. A pair of eight-pin power connectors are position at the end of the board. They're rotated 180 degrees and recessed as well. Apart from three 6mm heat pipes and a single 8mm pipe, the almost completely closed back of the card reveals nothing conspicuous. The rear bracket plays host to four display outputs. A pair of HDMI 2.0 interfaces is ideal for anyone with a VR HMD, while two DisplayPort 1.4 connectors make multi-monitor configurations easy. DVI is noticeably missing. Unfortunately, we also have to bring up an issue that affected our test results. While our press sample was sealed by the manufacturer, it became clear that this card had been used and dismantled before landing in our lab. The amount of thermal paste we found on the GPU package would have been sufficient for two or more cards, and was nearly counterproductive the way it arrived. We fixed this by cleaning the card and applying much better stuff in moderation. We realigned the heat pads, and even repaired the partially destroyed ones with similar replacements. In turn, we were rewarded with a four to five degree lower GPU temperature and significantly cooler VRM readings. Hopefully, that gets us close to PowerColor's stock performance, fresh from the factory. Although PowerColor's official documentation claims a 1607 MHz boost clock, GPU-Z reports 1630 MHz. That specification is mostly wishful thinking though, given the Red Devil's power limit. I wouldn't trust PowerColor's quality control. My old HD 5850 came with an "Engineering Sample" BIOS with no officially supported way of updating it. Nice to still see some AMD high end GPU reviews on Tom's. Well done. Unfortunately, this review continues to prove that AMD is well behind Nvidia in the upper tier GPU segment when it comes to gaming bang for the buck. AMD just doesn't have the R&D pockets that Nvidia does because they have shifted focus to CPU/APU production. I would love to see an AMD competitor to Nvidia's GTX x80 Ti high end GPU. Their last stab at it was with the Fury X against the 980 Ti which fell as flat as Bulldozer. It is the use of HBM 2 and the shortage that skyrocket the price of this card. The Vega 64, unfortunately, is a mining card. With proper undervolting and tweaks, it performs really well, unfortunately, for gaming at this price you better getting a TI. Still, if the price was about the same as a 1080, I would grab a Vega instead. "I wouldn't trust PowerColor's quality control. My old HD 5850 came with an "Engineering Sample" BIOS with no officially supported way of updating it." That's a long time to hold a grudge. I've had 2 PowerColor 290x's and Red Devil RX 480 and 580 cards. All of them were great performers and had better cooling than the majority of the competition. Also, they were all unlocked/dual bios cards. I like what PowerColor does with AMD cards. Card sounds great, looks awesome, but the price is double what its worth (and I say that as someone who owns a Liquid cooled Vega 64). Was $1100 US this morning, now a more reasonable $719. Still here in the US a GTX 1080 can be had for $120 cheaper minimum and performs basically the same. However at the price where you are its totally reasonable. "We have a hard time recommending..." -Igor Wallossek However... "9/10" and "Editor's Choice"
"But even though it's generally faster than GeForce GTX 1080, Nvidia's closest competitor is currently available at a $200+ savings. We have a hard time recommending any Radeon RX Vega 64 with such a chasm between boards best suited to 2560x1440 gaming." A GTX 1080 and Vega 64 have the same MSRP, but he's saying the fact that the Vega is selling for $200 more makes it hard to recommend. Although in reality the price difference is much lower in many places. The price delta between the cheapest 1080 and Vega 64 on PCpartpicker US is $30 right now ($70 for red devil specifically). On Newegg.com that expands to $50 and $90, but only because that includes a dinky single fan 1080 that's $20 cheaper. When switching BIOS, the Computer needs to be turned off, the switch set to the desired position, then Computer PSU turned back on. For my card, if I turn the computer Off, set the BIOS switch position to semi-passive, and then turn the computer on, the fan stays off (passive mode) while the OS boots up. In fact, when I first installed the card, the switch was already in semi-passive mode, so when the computer booted up initially, no fans spun. Had to shutdown, flip the switch, and power back up. That time, the fans did spin. Prices seem to be changing as the day goes on. I'd rather see the PC Red Dragon and Red Devil Vega 56. The Red Dragon is based from Nano PCB with half of the card exposed backplate for the heatsink. Anyone know if my EVGA Supernova 650 P2 PSU can handle a Ryzen 2600x OC'd to 4.2 and a Vega 64 (+50% power, Undervolt and HBM2 clocked to 1ghz)? As usual Tom's has fake AMD pricing. I used to love this site. Link reads $719, link goes to Newegg where it's actually $619. It's been that price for over a month, with the occasional rebate making it cheaper. 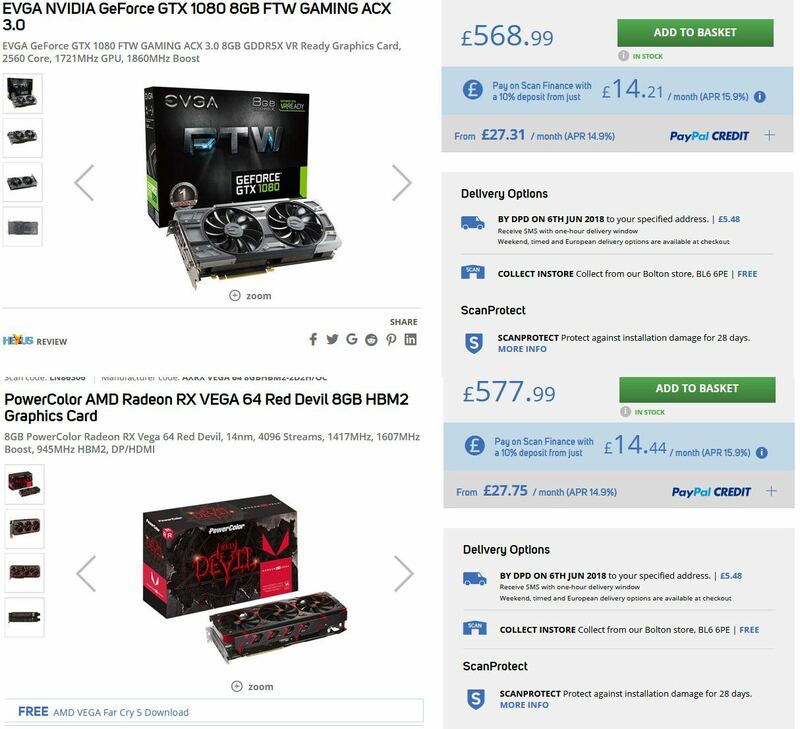 Where are these $419 1080s you speak of (article says $200 less)??? @Kaziel: I'd need to know more about your rig before I could give a definitive answer, but assuming you don't have anything too crazy installed, like a full raid or some monstrous cooling unit, you should be fine- at least with minimal over clocking. Heavy overclocking, not so sure- you don't exactly have a lot of extra wattage to play around with. Your best bet is to use one of the awesome tools out there specifically for calculating power supply requirements. Just do a quick google search for "power supply calculator". @Kaziel: I'd need to know more about your rig before I could give a definitive answer, but assuming you don't have anything too crazy installed, like a full raid or some monstrous cooling unit, you should be fine- at least with minimal over clocking. Heavy overclocking, not so sure- you don't exactly have a lot of extra wattage to play around with. Your best bet is to use one of the awesome tools out there specifically for calculating power supply requirements. Just do a quick google search for "power supply calculator". Still waiting on parts to arrive. Planning on just letting Ryzen Master auto overclock the 2600x. For the Vega 64 I plan to do the widely suggested undervolt, +50% power, and overclock HBM2. I have used the calculators and they basically say it's fine, but then again I left everything at stock. Not sure what the values are yet for going about overclocking the two parts so unsure what to put in the calculator.